Catch a Wave with Us! 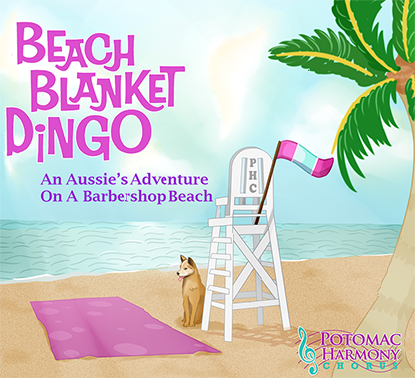 Get ready for summer with award-winning Potomac Harmony Chorus as we spend a day at the ocean – Beach Blanket Barbershop style. These fun familiar tunes will have you tapping your toes and singing along. Come join us for a beach party – with an Australian twist! You can purchase tickets from any chorus member, or online through our EventBrite listing. We are the Potomac Harmony Chorus, an award-winning a cappella barbershop ensemble. A chapter of Sweet Adelines International, we are women from all over the D.C. Metro area: students to seniors, working professionals to retirees. Together, under the leadership of Master Director Ozzi Mask, we make extraordinary music and memories. Potomac Harmony performs a variety of music from Broadway hits to fifties favorites to modern jazz, all in four-part harmony, barbershop style. In doing so, we preserve a uniquely American art form. We offer something for all audiences to enjoy and we love to entertain! Come join us at our weekly Wednesday rehearsals at 7pm. Email us or call 703-764-3896 for more information! Do you like to sing? Do you want to be part of a special group of women? All women over age 13 are welcome. Find out how to Join Us! We love to entertain and hope to see you at one of our upcoming performances. Hosting an event, such as a Holiday Party, Birthday or Fundraiser? Inquire about having the chorus or one of our quartets or octets, sing at your venue. We also deliver "Singing Valentines"! Arlington Cultural Affairs Division of Arlington Economic Development and the Arlington Commission for the Arts. Potomac Harmony participates in CultureCapital, Your Link to the Arts In Metro DC.